Hong Lei, Speak, Memory of Butterflies. Chromogenic print, 37 1/8 x 47 1/8 inches. Collection of the Nasher Museum of Art at Duke University. How does nature inspire us as readers, writers, and artists? I can create drawings showing the life cycle of a butterfly. I can explain the life cycle of a butterfly in writing. Tie a two-foot piece of string to each end of the stick to make a “triangle” to hang a mobile, then tie four dangling strings from the stick where the students can hang the leaves that tell each step in the life cycle. Point to the area a child mentions and repeat what he/she says to re-affirm/keep the discussion going. Tell the children they are going to be learning about the life cycle of butterflies, or, where butterflies come from. *Fun fact: both snakes and butterflies come from eggs! Tell them that butterflies lay eggs, so when they are born they hatch out of eggs. However, it is not a butterfly that hatches, it is a baby caterpillar! Explain that the caterpillar then eats and grows and makes a chrysalis around him/herself and when she comes out then she is a butterfly! Show a video from PBS kids. Ask if anyone noticed anything about the video. On the board, have the kids help tell you the steps in the life cycle of a butterfly and draw a flow chart with arrows as a visual prompt for their project. Next, the children draw, color, and cut out the four steps in the life cycle of a butterfly with the construction paper. On each of their four leaves, they write one step in the life cycle, and then on the other side of the leaf they glue the picture they made of that step. Finally, they attach the four leaves in order on the strings to their mobile! It is important to show the children a completed mobile as a model to guide them as they work. As an assessment for learning, have the children put their completed leaves in order for you to check their work before they are allowed to attach them to the mobile. Listen to The Very Hungry Caterpillar on CD. Illustrate the song for Farfallina and Marcel. Explore butterfly pictures with a magnifying glass. 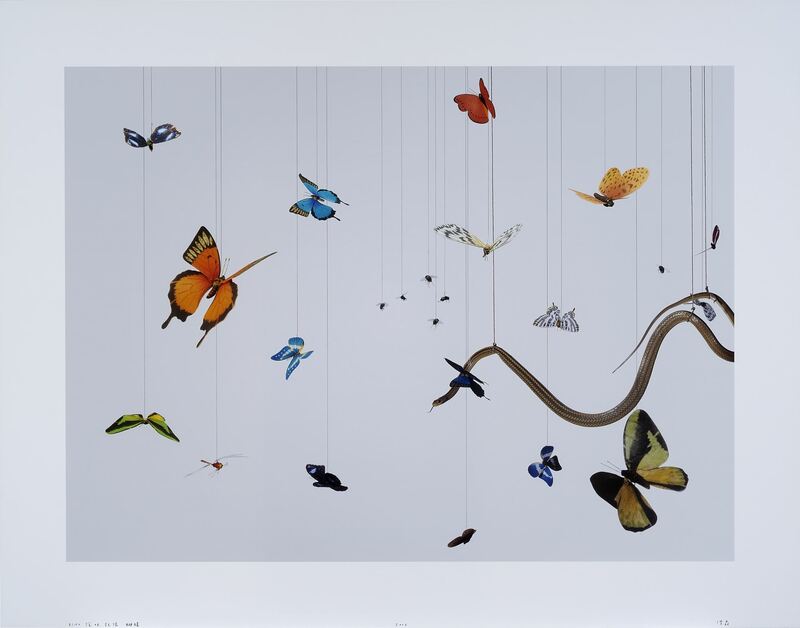 Use a cut up laminated copy of Speak, Memory of Butterflies by Hong Lei as puzzle. Beyond Grade Level: These students will write all the steps in the life cycle of a butterfly in complete sentences using descriptive and transitional words. At Grade Level: These students will be able to write all the steps in the life cycle of a butterfly. Below Grade Level: These students will be able to tell the steps in the life cycle of a butterfly and may need support from teacher to write the steps. As an assessment for learning, have the children put their completed leaves in order for you to check their work before they are allowed to attach them to the mobile. Make sure the writing on the back of the leaf matches the step the drew on the front. Have them explain the steps of the life cycle of a butterfly to you and then they can start to glue them to the strings on the mobile! Hong Lei, Speak, Memory of Butterflies, 2005. Chromogenic print, 37 1/8 x 47 1/8 inches (94.3 x 119.7 cm). Collection of the Nasher Museum of Art at Duke University, Durham, NC, USA. Museum purchase, 2007.2.1.2. © Hong Lei. Courtesy of the artist and Chambers Fine Art.